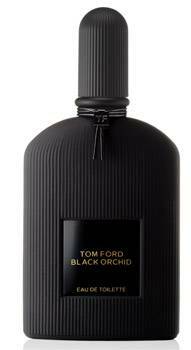 Tom Ford introduces Black Orchid Eau de Toilette, a distinctly different encounter of the Black Orchid fragrance. Experience the seductive breakthrough in a new light with its own olfactive journey. Long-lasting with a more open, immediate expression, the custom-grown Tom Ford Black Orchid instantly takes center stage, inviting you inside in a way never before experienced in the classic signature fragrance. The initial impression is explicitly pronounced with the sparkling, petal-rich tuberose revealing its full floralcy from the start. The top note sensuously blends black truffle and ylang mingled with fresh bergamot and delectable black currant. The dramatic heart of the carnal, sophisticated fragrance is the elusive Black Orchid, created from Tom Ford's quest for 'the perfect flower – luxurious, elegant, pure and sophisticated." Blended with tempting florals and rich fruit accords, the Black Orchid is up front and center from start to finish. Further deepened with intoxicating lotus wood, the decadent noir gourmand accord is balanced by patchouli, incense and vetiver. Vanilla tears add fluid creaminess to warm balsam and smooth sandalwood. matte black folding carton with gold lettering. Tom Ford Black Orchid is available at selected David Jones, MYER (selected stores), Sephora and Harrolds Luxury Department stores and www.davidjones.com.au.